Isn’t it fascinating how every family has their own holiday traditions and that includes what gets served at holiday dinners? I love hearing about all of the things that other families have on their Thanksgiving menu and discovering new favorites. 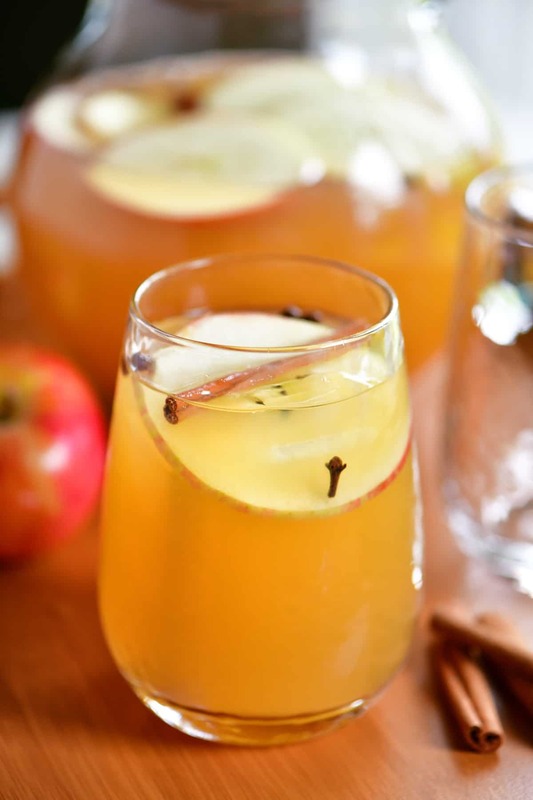 This sparkling apple cider is inspired by my sister-in-law’s family. They always serve it for Thanksgiving and keep it in the fridge during the week surrounding the holiday. Where is the Sparkling Apple Cider Recipe? 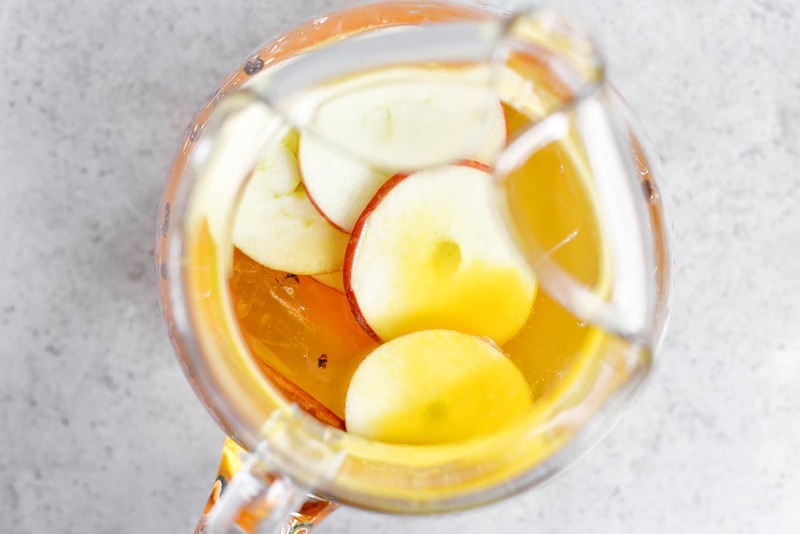 In this post, I will share step-by-step instructions with photos for how to make the apple cider, as well as answering FAQs about the recipe and sharing a video. But you can go directly to the recipe by scrolling down to the bottom of the post. 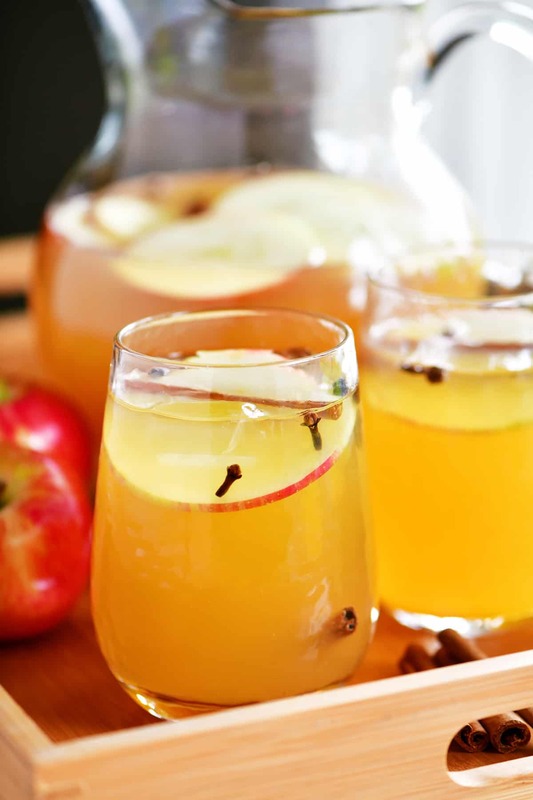 To make this sparkling apple cider look pretty in a glass pitcher and to add flavor, start by adding some garnishes. Slice an apple horizontally to get the pretty star shape in the middle and remove the seeds. 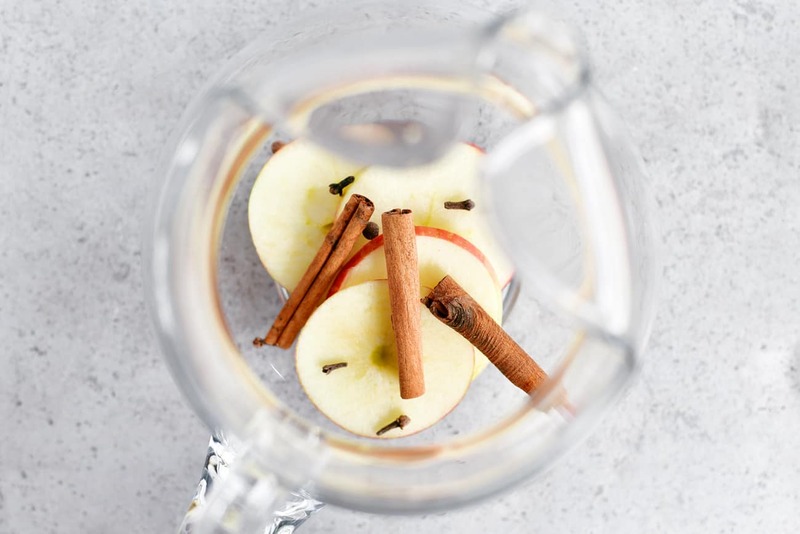 Put the apple slices, cinnamon sticks, whole clove, and whole allspice in a 2-quart glass pitcher. It’s not always easy to find apple cider at the local grocery stores so regular apple juice works too. Add the orange juice concentrate and stir to mix. Orange juice concentrate gives the sparkling apple cider some tangy sweetness that goes perfectly with the apple juice and cinnamon. 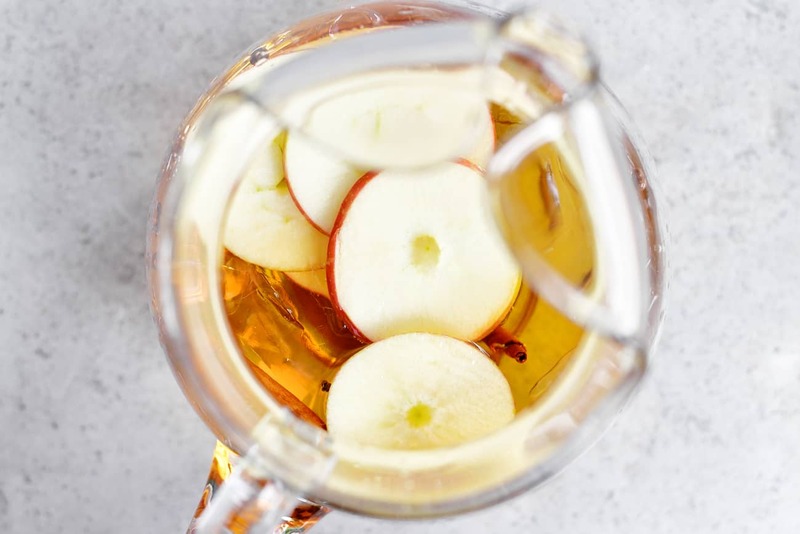 The sparkling part of the sparkling apple cider comes from adding ginger ale and it should be added right before serving so that it is still sparkling when served. 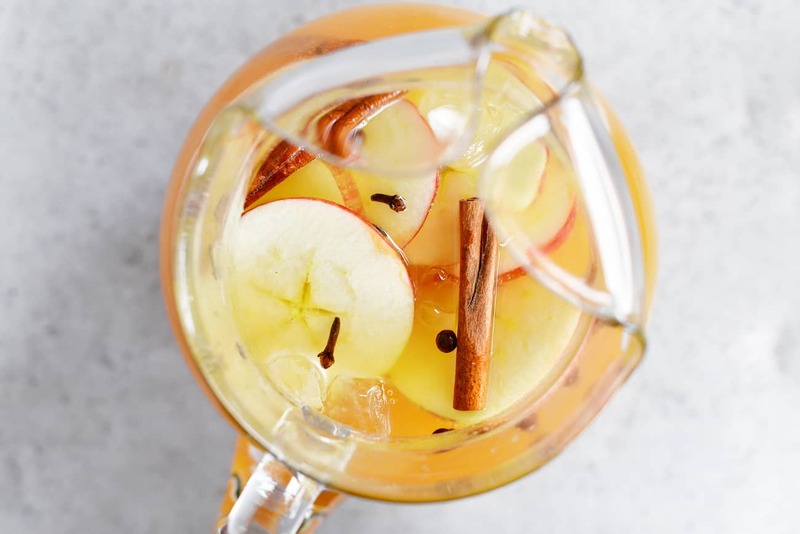 To make each individual serving look pretty, put ice in glass cups and add apple slices, cinnamon sticks, and spices before filling with sparkling apple cider. 1. Can I use orange juice instead of orange juice concentrate? Yes, but will not add as much flavor as the orange juice concentrate does. 2. How can I prepare this ahead of time? Follow the steps three steps and place the pitcher in the fridge. Slice additional apples and soak them in club soda for three minutes to prevent browning. Add the ginger ale before serving. 3. Could Sprite be added instead of ginger ale? Yes! We love the flavor of ginger ale but Sprite, 7-Up, or Mist Twist could be used instead. Frosty Mocha Punch: Frosty Mocha Punch is a cool, refreshing combination of chocolate, coffee and ice cream! It’s always a part of our family celebrations. Raspberry Sherbet Party Punch from Natasha’s Kitchen: This party punch is so pretty and refreshing. It is perfect for baby showers, church potlucks, Valentine’s day parties, and family get-togethers. Fruit Punch Recipe from Culinary Hill: Super sweet, super fruity, and guaranteed to be guzzled by kids everywhere. Dress it up (or down) all you want with endless variations. 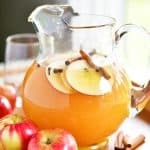 Slow Cooker Apple Cider: Slow Cooker Apple Cider with caramel sauce and cinnamon syrup is so easy to make. Serve it in the fall and winter for Halloween, Thanksgiving, and Christmas. 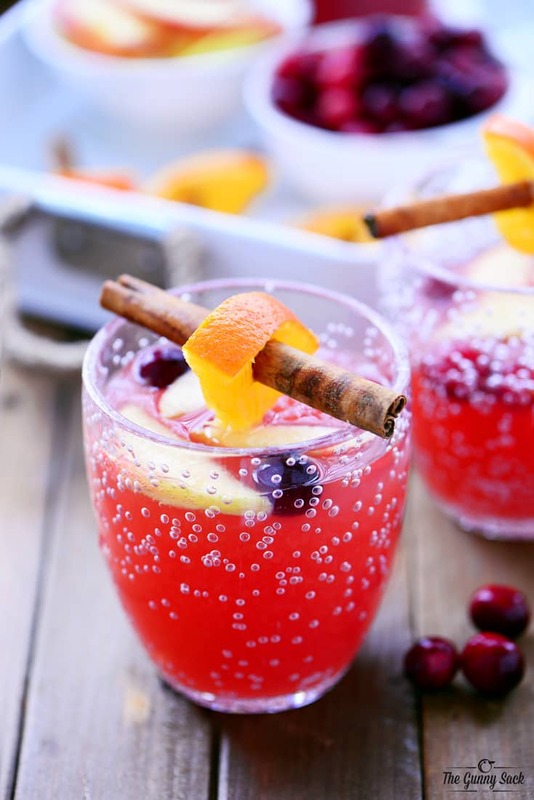 Pomegranate Lime Holiday Punch: Sparkling Pomegranate Lime Holiday Punch is a pretty family-friendly drink that’s perfect for holiday celebrations & parties from Thanksgiving to Christmas! Thinly one of the apples horizontally, remove the seeds and place the slices in a 2-quart glass pitcher. Add 3 cinnamon sticks, whole cloves, and whole allspice. 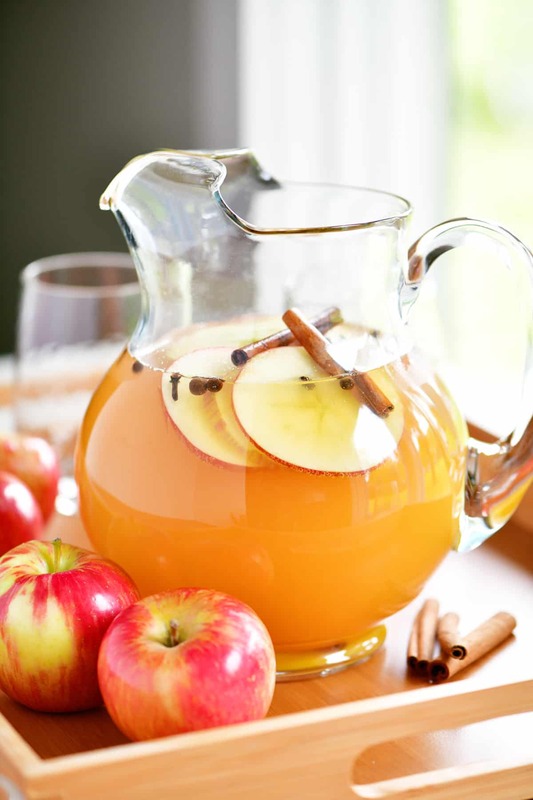 Pour the apple cider or apple juice into the pitcher. Stir in the orange juice concentrate. When preparing ahead of time, stop at this point and store in the fridge until ready to serve. Thinly slice the second apple horizontally and remove the seeds. Put ice cubes, an apple slice, and a cinnamon stick into 8 glasses. Pour the sparkling apple cider into the glasses and serve.